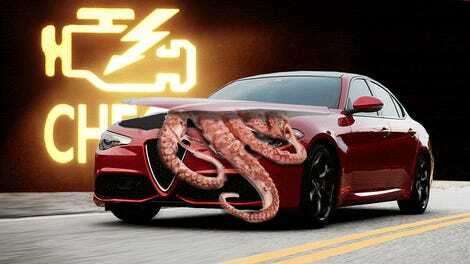 Last year, Automotive News Europe’s sources claimed that the Alfa Romeo Giulia was delayed for “extensive reengineering” after the car “failed to pass internal front, side and rear crash tests.” Fiat Chrysler then outright denied this to Road & Track, and while we may never know the truth, we do know this: the production Giulia can crash with the best of them. The 2017 Alfa Romeo Giulia just received the highest safety rating that the Insurance Institute for Highway Safety issues, Top Safety Pick +. To get that award, the Alfa received good ratings in all five crashworthiness tests, a superior rating in front crash prevention, and a good headlight rating. In addition to scoring IIHS’s top rating, the Giulia has also received Euro NCAP’s highest “five star” rating. So whatever alleged issues Alfa’s engineers were having with passing crash tests seem to have been completely resolved. Because based on these ratings, the Giulia is a bit of a tank.